2. In a large bowl mix together, butter, shortening, peanut butter, sugar and brown sugar. 4. In another bowl, combine flour, baking soda, baking powder and salt. 5. Slowly combine the dry ingredients with the wet ingredients as you are mixing. 7. Using a cookie scoop , or your hands make heaping tablespoon sized balls of cookie dough. 8. Put balls on baking sheet , a couple of inches apart. 9. Slightly flatten the balls with a fork, making a criss cross pattern. 11. Meanwhile, put chocolate chips and shortening in a small (microwave safe) bowl. 12. Microwave for about 1.5-2 minutes, stirring every 30 seconds, until chocolate is completely creamy. 13. After cookies are done cooking, cool them for about 5 minutes on the baking sheet. 14. Remove cookies and place on a wire rack. Cool for another 10 minutes or so. 15. Dip one edge of the cookies in the chocolate bowl and lay out on waxed paper to dry. 16. For a quicker hardening of the chocolate, put the cookies in the freezer for a few minutes. 17. Enjoy with a nice big glass of milk. 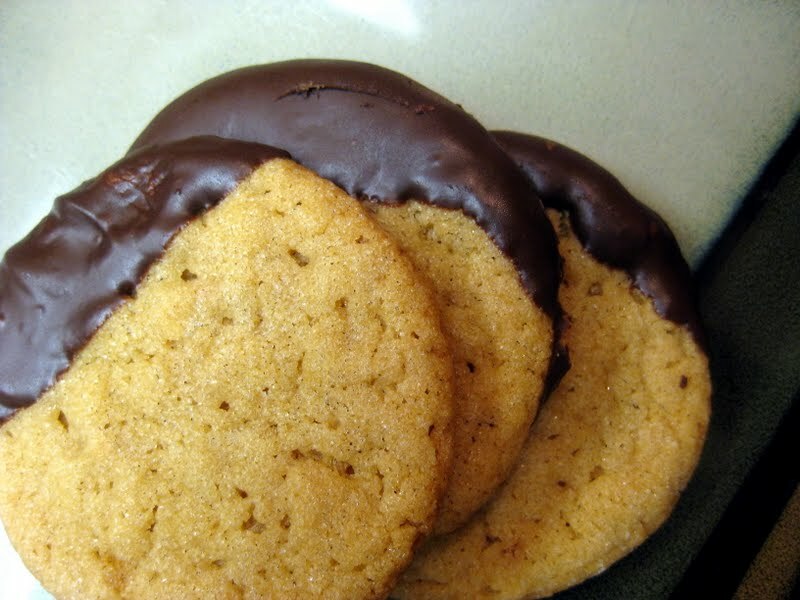 **The slightly crispier cookies are easier to dip in the chocolate. Even after putting the cookies in the freezer, once removed (thankfully) the chocolate stayed hard, and the cookie got soft. Even the cookies that I baked a little longer, were still relatively soft and chewy. And as this was my first time making peanut butter cookies on my own, this will definitely be my go to recipe every time in the future. These were seriously so good! And if you don’t feel like dipping your cookies in chocolate you can use this recipe anyway. They taste so good fresh out of the oven that they melt in your mouth. Yum! Plus these cookies store well in an airtight container and will be good for about 5 to 7 days. Chocolate and peanut butter are my two favorite foodie things on earth! These sound scrumptious! Thank you so much for sharing at Savvy HomeMade Monday and I hope you will come back and party! All I can say is…mmmmm! Just love the mother/daughter connection of this blog. Those cookies look so yummy. Come over and visit. We have a wonderful apple chutney recipe to share. Yumm, reminds me of when I worked at Mrs. Fields.